Maybe it’s the foodie in me or maybe it’s just that I’m simple-minded… but whenever I make Spaghetti Squash it absolutely fascinates me. The moment you run a fork across the roasted squash and all the strands of spaghetti appear… ahh it gets me every time! 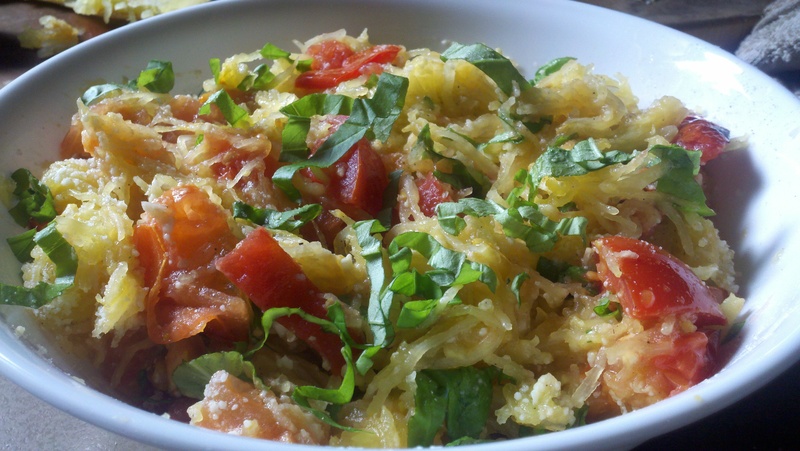 I love spaghetti squash for this reason, not to mention it is a quick and easy meal to make, it’s very versatile, and can serve as a great alternative to carb-y pasta. All you need to do is cut the squash in half longways, place it on a baking sheet and pop it in a 350 degree oven for about 40 minutes. Then remove it from the oven and run a fork across the guts of the squash, scraping all the strands of spaghetti out. At this point you can top it with anything and everything you would top regular pasta with. You could simply pour a jar of Classico Alfredo on top or go as far as making shrimp scampi out of it. In this picture I simply tossed it with 2 T. of olive oil, a handful of parmesan cheese, and a chopped up a tomato, garlic clove, and basil.